Mortimer Close, Woolavington, Nr Bridgwater TA7 8EH, is a most impressive and particularly spacious 4/5 bedroom semi-detached property situated within a quiet and pleasant corner position in a small cul-de-sac near to the centre of the village of Woolavington, itself approximately 3½ miles north east of the town centre of Bridgwater where all main town amenities and facilities can be found. The village of Woolavington offers good local amenities including church, co-op/post office, general store, primary school and regular bus service to the town centre of Bridgwater and Street. The village is also conveniently located for the M5 motorway being approximately 2 miles away from its nearest junction. The original property is believed to have been built approximately 40 years ago with further additions having taken place in more recent times. It is constructed of cavity walling with rendered elevations under a pitched, tiled, felted and insulated roof. The extensive accommodation briefly comprises; Large Reception Hall/Porch, Inner Hall, Lounge, Dining Room/Bedroom 5, Sitting Room, Sun Lounge/Conservatory, Kitchen/Breakfast Room, Bedroom and Bathroom, whilst to First Floor are 3 further Bedrooms and Shower Room. The property benefits from a brand new oil fired central heating system, UPVC double glazed windows and doors and all fitted floor coverings included in the asking price. The property has been the subject of considerable upgrading and improvements in recent months with the provision of the sun lounge/conservatory, new UPVC windows to first floor, side porch/conservatory and new floor coverings and decoration. 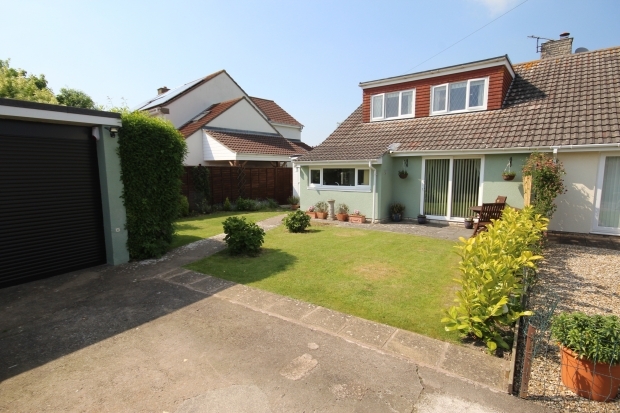 There are very good sized gardens to the front of the property as well as a pleasant enclosed rear garden as well a Garage with electric roller up and over door and having the benefit of a new roof covering, and adjacent Workshop/storeroom. To conclude this is a most individual impressive and spacious property offering many opportunities and as such early viewing is advised to avoid disappointment. INNER HALL Fitted carpet. Radiator. Coving to ceiling. Hatch to roof space. Understairs storage cupboard with separate cupboard to one side. LOUNGE 17’4” x 11’8” Attractive brick/tiled fireplace and surround with inset open grate. Tiled hearth and mantle. UPVC double glazed patio door to garden. Radiator. Carpet. DINING ROOM/BED 5 10’1” x 7’5” Radiator. Carpet. Coving. SUN LOUNGE/CONSERVATORY 9’0” x 8’1” Feature glass roof. Laminate flooring. UPVC double glazed door to garden. KITCHEN/BREAKFAST ROOM 11’7” x 10’1” Acrylic inset single drainer sink unit with cupboards under. Deep roll top working surfaces with further cupboards and drawers under. Plumbing for washing machine. Tiled splashback. Recess for range cooker, stainless steel extractor over. Larder with shelving. BEDROOM 1 12’6” x 8’4” Range of fitted wardrobes to one wall. Radiator. Carpet. BATHROOM Panelled bath with wall mounted electric shower over, shower curtain and rail. Vanity unit with enclosed wash hand basin and cupboards under. Fitted carpet. All walls fully tiled. BEDROOM 2 11’8” x 9’0” Radiator. Carpet. BEDROOM 3 10’1” x 9’2” Carpet. Radiator. BEDROOM 4 8’9” x 8’5” Hatch to roof space. Carpet. Telephone point. Recess storage space into eaves. SHOWER ROOM Deep shower cubicle with wall mounted electric shower. Pedestal wash hand basin. Low level WC. Carpet. Radiator. Door to roof void with boarding leading to oil fired boiler. Electric light. OUTSIDE The property stands on a particularly large and well stocked plot comprising to the front long concrete drive with parking for approximately 3 cars leading to the GARAGE 15’7” x 7’11” with roller up and over door, power, light and alarm system. Separate WORKSHOP/STOREROOM to side 16’6” x 5’4” with light. The front garden is laid predominantly to lawn with feature laurel hedge boundary, variety of plants, shrubs and oil tank located behind garage. To the side of the property is path, garden, various shrubs and plants. Outside tap. Side wooden gate leads to the well enclosed rear garden with fencing to all three boundaries, concrete patio area, lawn with extremely well stocked beds and borders.